I think I need to replace my hardly-used bottle of Titebond 'Extend' wood glue. Its shelf life is about half of ordinary Titebond and I see it is starting to thicken, but not yet stringy. So, not finding any locally, I was looking around online and I found two versions of 'Extend' in 16-ounce bottles, #4134, whose bottle looks like the one I already have, and a newer-looking bottle with a blue label, also labeled 'Extend', #9104. Anybody using #9104? Hate to overlook a better product out of ignorance. I think 4134 is the blue bottle, right? That is Titebond II Extend, which I think means Titebond II with some extra water to increase open time. I have a bottle of 9104 and use it for binding sometimes when I need more time. Not for gluing purfling to binding before bending, but for putting the binding on the guitar body. 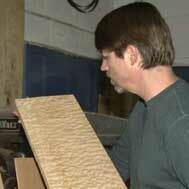 For purfling glue up I use Titebond III. Franklin has a tech support number on their website and are very generous with help. You would likely get more info than you can digest. My memory is so good, sometimes I remember things that never happened. Thanks, folks. I wanted to stay away from Titebond II and its permutations. Much obliged. I make my own TB Extend for things like bindings where I want some more working time. I squeeze some Titebond into an empty cat-food can, add a bit of water, and mix it up with my glue brush. Viola. I think a YouTube tutorial is in order. BTW, how are viola's tuned again? Aaaaaand we're off the rails. I did a glass plate test of Titebond, Titebond Extend, and Elmer's Carpenter's glue. Of the three, Titebond I Extend was the hardest of the three, followed closely by the Elmers. Both were significantly harder than traditional Titebond. I do not believe Titebond Extend is simply Titebond I with additional water, as its viscosity is similar. ... I do not believe Titebond Extend is simply Titebond I with additional water, as its viscosity is similar. "Titebond Extend, Titebond Original, or Hot Hide Glue.. That's my order of preference. Extend contains wood flour (very fine sawdust) to increase open time, thermal resistance, and improve creep performance... Which is worried about far too much in luthiery. The use of wood flour is a neat trick in formulation since PVA relies on proximity to form bonds, the microscopic particles of wood effectively increase the bond surface area. It's my go-to for all guitar gluing operations."